Many states are now having their back to school tax free weekends. CLICK HERE to see if your state is participating and to find out what items will be tax free. Online today only. Save an extra 20% off on kids shoes & clothing. Promo Code: UNIFORM. Purchases over $50 get Free Shipping. Go through Ebates for an extra 3% cash back. Macy’s – Online today only. Save an extra 15 off their HOME Items & an extra 10% off Electrics & Electronics. Promo Code: REFRESH. Purchases over $50 get Free Shipping. Go through Ebates for an extra 3% cash back. Kid’s, Home, & Electron Sale end August 14, 2011, unless otherwise noted. Family & Friends Event – Click Here to download your savings pass to save an extra 20% off of clothing and accessories, 15% off shoes, bed & bath items, & window fashions, 10% jewelry, luggage, & ready to assemble furniture. Click here for printable coupons. Sears will also donate 5% of your purchase to the boys n Girls Club when you also present this coupon. Online Sears Family and Friends savings begin Mon., August 15, 2011 and end Tues., August 16, 2011. Promo Code is FAMILY 5. Want more savings? Go through Ebates for an extra 4% cash back when you purchase your items online. Extra 20% off ends today (August 14, 2011). Discount is taken off at the registers in-stores (no coupon needed). Online prices already reflect the 20% off. Click Here to visit their site for more details. 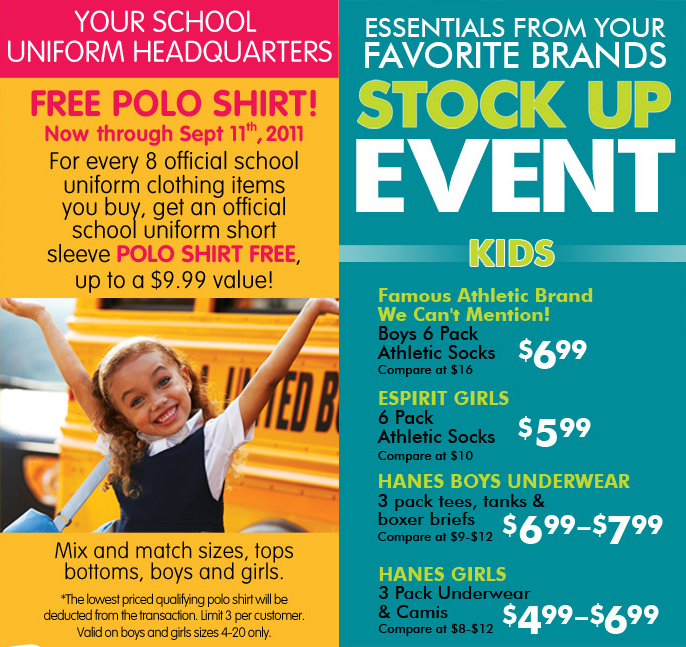 For every 8 official uniform clothing you purchase, get a free polo shirt (up to a $9.99 value). This deal is valid through September 11, 2011. The lowest priced qualifying polo shirt will be deducted from the transaction. Limit 3 per customer. Valid on boys and girls sizes 4-20 only. 25% off August 14, 2011 Click Here for 25% off coupon. 40% off Regular-Priced Jolee Stickers August 14-20, 2011. Click Here for printable coupons. 15% off any order at The Childrens Place. Code X3E2011 (Exp. 09/06/2011.) Go through Ebates for an extra 2.5 % cash back. Remember orders wanting cash back must be placed online through their site and the money is awarded every 3 months. Also, keep in mind that you can use this discount code on top of already reduced merchandise. 40% off all pants and jeans. Click through this link for savings. Go through Ebates for an extra 2.5% cash back when you purchase your items online. $40 or $45 Off of $100 New York & Company Coupon. Click Here to Print Coupon for a $40 discount on $100 or $45 discount if you use your NY&C Rewards Credit Card. See coupon for more details. ( August-15-2011 ). Go through Ebates for an extra 2.5% cash back when you purchase your items online. 11×14 $64.99 $14.99 Most Popular! 16×20 $88.99 $38.99 Best Value!